Old school French still lingers in way west Tribeca at Capsouto Freres, a restaurant that opened the year I was born, 1980. To be opened for 31 years in New York City, is more than a milestone, it's a miracle. After a meal there I could see why it has lasted so long. 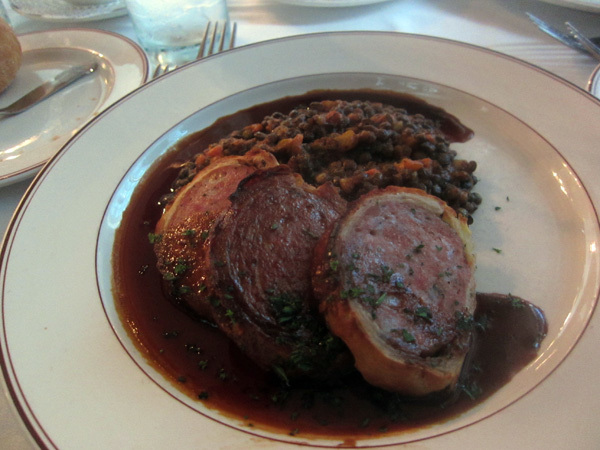 The place delivers fine classical French fare, that was popular back in the day, but still has not lost its luster. Saucisson de Lyon en croute with Madeira Sauce, is delicious and grand. The meat succulent and superb. A vegetable terrine is classically lovely. Filet Mignon with Madeira Sauce is perfectly cooked and a fine rendition of this popular meat dish. The Madeira sauce adds just the right note of sweetness to compliment this baby. Pike Quenelle, a dish I had heard about throughout my life, but never encountered, is fabulous here. Beautifully light in texture, but full of flavor, this dish had me swooning for more. Do save room for dessert, and order on of the best soufflés in New York City. A special Roi René Rouge Cherry Soufflé was out of this world. Dip your spoon in and have a magical moment. So for old school French and old World charm, take a trip all the way to west Tribeca, where Capsouto Freres awaits.